The Proposal of the Initiative is to offer the choice of the affixation of a logo/sign and a historical clarity in the case of the dissemination of the text including calls to hate (particularly racial as in the symbolic case of Mein Kampf). 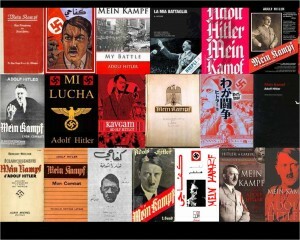 Mein Kampf, written by Adolf Hitler, is one of the most symbolic books of hate. The rights of Mein Kampf, held today by the land of Bavaria, will fall into the public domain after 2015. The entrance into the public domain opens a voice to an even larger dissemination of this work or truncated excerpts, which poses a problem in the absence of a minimal historical clarification. The applicable rules to the dissemination of a guidebook to hate such as Mein Kampf vary from country to country. This dissemination of hate, the encouragements and incitation to violence and discrimination occur today, as the Oslo massacre could once again recently show us, and can be disseminated even easier over the Internet. The applicable rules to the dissemination of such works exist and must continue to be respected but are the truly adapted to the online world. In France, the Court of Appeal of Paris decided in 1979 to allow the sale of the book, conditioning this authorization on the insertion of a warning to the readers for a single French version disseminated in France. This solution appears as insufficient on a global digital scale. In fact, in the time of the Internet, the disparity of the means of dissemination of a text such as Mein Kampf calls to the idea of educations means and protection of youth. The warnings exist for films, television, video games, and even music. They are not adapted to online content that call to racist crime such as Mein Kampf. The entrance into the public domain (70 years after the death of the author) drives us to examine numerous issues of national law, international law, history, and above all to question why the dissemination of the book is still massive in many regions of the world and on the cyber dissemination of hate texts such as this. The Hate Prevention Initiative (www.hateprevention.org), is organizing on October 11, 2011, at the Auditorium of the Maison du Barreau of Paris, from 13h to 19h30, a public Forum on these issues in order to react and call for solutions against a mass diffusion of Mein Kampf without putting it into context and providing any explanation, a dissemination that will soon be reinforced by its nearing entrance into the public domain. Fabrice d’Almeida – Professor of History (University of Paris 2) – French Media Institute;Josselin Bordat – Historian; Jean Castelain – President of the Paris Bar association;Philippe Coen – Founder of the Hate Prevention Initiative / Vice President AFJE; Jean-Marc Dreyfus – History Professor (University of Manchester); Loraine Donnedieu de Vabre – Attorney; Linda Ellia, Painter, Photographer www.notrecombat.net exhibited at the Memorial of Caen; Marie-Anne Frison Roche – Law Professor (IEP Paris) – MAFR ;Dominique de la Garanderie – Former President of the Paris Bar Association, Attorney;The Rt Hon Lord Goldsmith, QC – Barrister (Former Attorney General – Great Britain) ;Stéphane Marchand – Journalist France 24 ; Marc Mossé – Vice President UNIFAB/Microsoft France ; Olivier Orban – President Plon Editions; Attorney; Charles-Edouard Renault – Attorney; Edith Raim, Doctor in History – Institute of Contemporary History in Munich (IfZ) ; Anthony Rowley – Professor (IEP Paris) Fayard Editions; Jean-Marc Sauvé – Vice President of the Conseil d’Etat ; Philippe Schmidt – President INACH, Vice President Licra, Attorney; Alain-Gérard Slama – Professor (IEP Paris) Journalist, writer; Francois Zimeray – Ambassador of France for Human Rights; Antoine Vitkine – Journalist, writer. “At a time of increased dissemination that will be offered to Mein Kampf once it is in the public domain, we propose a voluntary warning of hate content: just to warn and put it into context. It is a step towards ‘responsible freedom of expression’ in the same way as warnings existing in cinematic films, television, video games, and ‘explicit’ content in music, etc…” explains Philippe Coen. The Hate Prevention Initiative calls for a voluntary warning and the creation of a Center for Tolerance destined to measure the problematic dissemination of hate to recall the texts concerns and the means of education and prevention. The complete agenda of the Forum “Mein Kampf in the public domain and the dissemination of hate: what preventative actions to take for tomorrow?” is available on www.hateprevention.org. Entrance to the Forum is free, reservation required.